Ooh la la! I love this book! 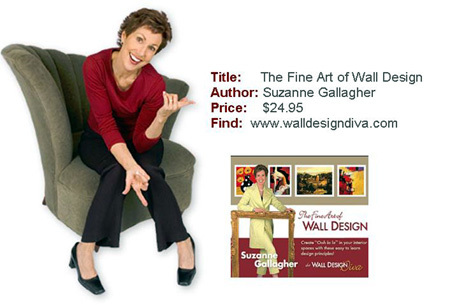 We visited Suzanne Gallagher’s website the other day, www.walldesigndiva.com. The next thing you know, we were talking on the phone and voila- there’s a copy of her book on my desk! She’s one energetic lady who is passionate about her art – and it shows in her book, The fine Art of Wall Design. I can’t tell you how many people come to our blog searching for tips on hanging artwork, arranging artwork, tips on artwork, etc. I always say that there are no rules to decorating, just rules of thumb, and Suzanne has just hit the nail on the head. She has combined all the principles and ‘rules of thumb’ that designers put into creating walls that we can love. She covers everything from choosing, arranging, hanging, terminology and everything in between. If you are simply looking for ideas or ready to hang artwork, but afraid to commit to that nail in the wall – this book is for you. Check out her website above. You can even test your knowledge by taking her free Wall Design IQ test. The Fine Art of Wall Design sells for $24.95.